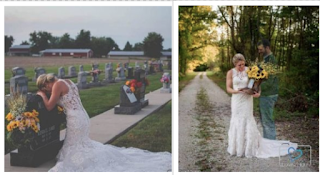 A grieving bride wore her wedding dress to visit her fiance’s grave on the day they were supposed to get married. Jessica Padgett and Kendall James Murphy were engaged to be married on September 29, 2018. Sadly, Murphy, who was a firefighter for Montgomery, Indiana, was tragically killed in November 2017 when his drunk colleague, Colby Blake, crashed his vehicle into three cars as they responded to a call. Kendall arrived on the scene in his own car, which he parked before getting out and heading to the car’s back door to retrieve his protective clothing. Blake, Kendall’s colleague, also drove to the scene, but he allegedly had a blood alcohol level of .21 per cent at the time – more than double the legal limit of .08. Blake rear-ended a truck as he drove, but continued driving. As Kendall went to get his clothes, he was hit by Blake’s car and was killed instantly. On the day they were supposed to get married, Jessica got dressed in her wedding dress and held a ceremony. 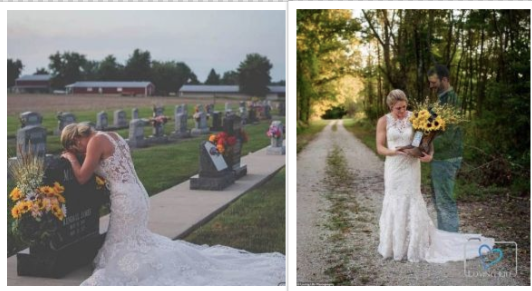 Heartbreaking photos show Jessica Padgett kneeling in front of Kendall James Murphy’s headstone on September 29, the day they would have gotten married. In honour of her husband’s memory, Jessica posed for several photos with Murphy’s boots, his tombstone, his firefighting gear and with loved ones. In one tear-jerking image, Jessica is seen holding Murphy’s boots with his image photoshopped in place beside her.